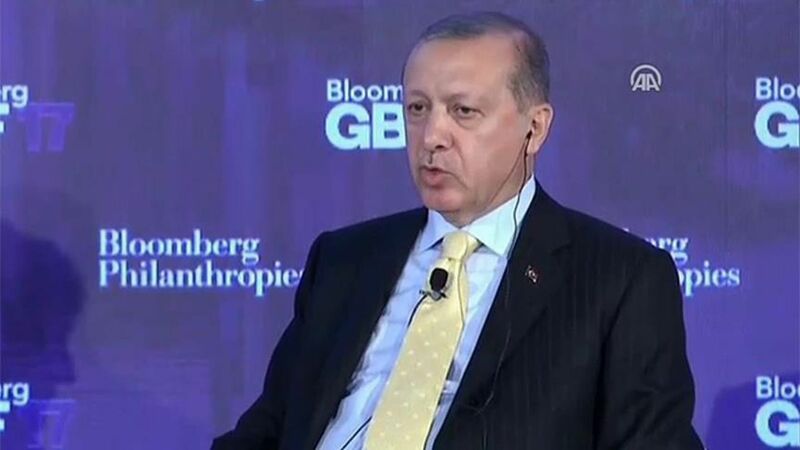 Erdogan suggests Russia getting more results in Syria than U.S.
Turkish President Recep Tayyip Erdogan told Bloomberg's John Micklethwait Wednesday that he has had several conversations with both the U.S. and Russia regarding how to handle the crisis in Syria. Erdogan said nothing came of repeated talks with the U.S. under the Obama administration, but with Russia there have been tangible results. Why it matters: The U.S. and Russia, which is allied with the Assad regime, have different visions for a post-war Syria. Who has done more to help with Syria, Obama or President Trump? Erdogan dodged, stating that he "will not invest myself in an effort to measure them both." However, he said he has expressed his thoughts to Trump and hopefully they can "unite on these facts and take future steps accordingly" at their meeting in NYC Thursday. "The conflict in Syria has been going on for the last several years, and unfortunately the person leading Syria, Assad, has killed many of his own people... it's state-sponsored terror... I have repeatedly warned Assad about this conflict and I have used our friendship as a vessel to warn him but nothing has changed." Erdogan said that while Turkey is a member of NATO, it doesn't have the same access to powerful weapons and systems as other member nations do. And with the violence raging in Syria, the weapons deal with Russia was necessary to protect his country. Erdogan said Turkey has requested drones and missiles for many years from other countries, but has been repeatedly rejected, so "we were forced to take these matters upon ourselves." Leaders should "increase the number of allies," said Erdogan, adding that this is what he is trying to do in regards to Russia. Relations with Putin: On Monday he will have a phone call with Putin, and next Thursday they will meet for dinner to discuss the problems in Syria. "For the last 54 years we have been lingering at the doorstep of the EU... they say 'there have been countries before you and we still haven't admitted them.' NO! This is a political embargo on Turkey... No country ever suffered from such an approach."